Making a casino tip when playing game with a dealer is very important. Casino dealers have a fairly low salary though they have a very stressful job and have to work long hours in a high paced work environment. Most dealers make their living through the tips that the players leave them. Tipping dealers has always been hotly debated and several players still feel that they should not tip the dealers at all. However, to our mind verbal tips for dealers should be always provided. Though it is a known custom at the casinos that the players must tip their dealer, there are several circumstances when in fact the player should not tip the dealer at all. If the dealer at the table is rude or incompetent or if he seems to be more focussed on gathering fat tips rather than focusing on providing decent service to the players it is understandable if you do not leave a tip to the dealer. However, dealers who are competent and friendly and make the game more pleasant for the players must be definitely tipped. If this dilemma if too hard for you to deal with, you might want to play at online casinos. You don't need to tip anyone at a website, do you? 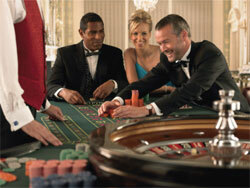 It is a common misconception that dealers at the casinos are there to take as much money from the players as possible. For this reason several players do not leave a tip for the dealer. However, this is a false belief. Dealers are just doing their job and their main job is to provide service to the players at the table. In fact, most dealers are happy if the players at their table win more money. When a player wins more money, he/she will leave more tips for dealer and therefore a dealer would always wish that their players win more money. Players in their turn should know how to tip a dealer and do this in a proper way. How can dealers get more tips? Dealers can get more tips if they make players act at ease by being friendly and chatting with them. A good dealer will be efficient to understand when he/she needs to slow down the game for novices and when they need to speed up the game for professionals. A good dealer at roulette will give enough time to the players to put their bets down before spinning the wheel and would help the players in any way that they can. Dealers in fact help the players in several different ways; they make the game more enjoyable for the players. Most serious players are always calculating the odds of the casino against their own edge. These players always believe that if they tip the dealer it increases the advantage of the house and it decreases their own chances of winning. However, tipping a dealer has nothing really to do with it. Even if a player tips the dealer it will not reduce his/her chances of winning at the game. As it was already said, tipping the dealer is still a personal choice. If the player feels that the dealer has been friendly and efficient, they can tip him. However, if the dealer to fall short of their expectations and has not provided good service or has been rude to them it is up to the player to decide if the dealer should be tipped or not.